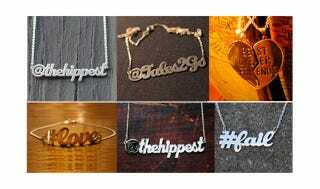 Survival of the Hippest puts a new spin on the classic nameplate necklace with its Twitter–related ID jewelry. These custom accessories come in silver or gold. You can even fashion a hashtag tie clip. And they said techies weren't trendy. Click here to see all the nifty gifties in Gawker's Plugged In Gift Guide—for the oversharer in your life. The whole shebang is brought to you by Sony Internet TV.